Vive la revolution! Following 2017’s irrepressibly lovely Little Mermaid, Pins and Needles Productions return to The Egg with Christopher William Hill’s colourful, creative and characterful adaptation of Baroness Orczy’s original story. It’s 18th century France and revolution is in the air. As more and more bewigged aristocrats find themselves at the mercy of Madame Guillotine, one man starts helping them to evade the law and skip across the Channel to England. The hidden hero of the hour is here renamed the Scarlet Pimple (his nom de plume a reference to childhood acne). But what, everyone wants to know, is his real identity? This new family show – aimed at children aged six and above – has a couple of things in common with last year’s play. Firstly, it’s brilliantly designed by Zoe Squire. 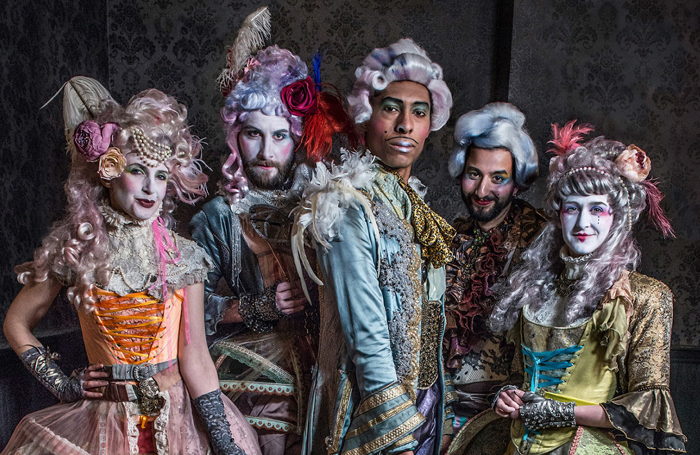 Like a more punk version of Sophia Coppola’s Marie Antoinette, the cast wear a blend of frou-frou finery with fluorescent accessories, slashed skirts and towering wigs. Secondly, Emile Clarke makes a very welcome return, this time as the dapper Sir Percy, an unbeloved husband who keeps disappearing on unspecified trips and returning with nothing but a small Toblerone for his unimpressed wife, Margueritte (Laura Matthews). Some of the best moments come from the comical songs, composed by Jack Dewry, particularly Dominic Allen’s villainous performance of Chauvelin’s poodle-hating anthem. The story is perhaps a teeny bit too thin in places, but it’s an imaginative and extremely fun piece of Christmas theatre – even for the cat lovers in the audience.